When Bill Low created AudioQuest in 1980 it was really just a small variation of the audio activities he had started in 1972. During high school and early college, Bill had struggled to have the best audio system he could. He had built dozens of Heathkit and Dynakit amplifiers, preamps and tuners for classmates. 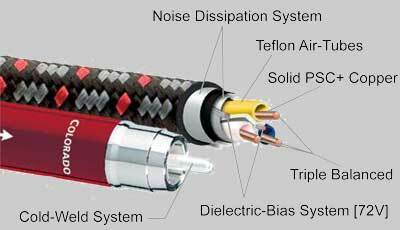 The evolution of AudioQuest cables has taken place over the entire life of the company, however several of the most important basic design criteria were established very near the beginning. These basic priorities were established as a result of empirical experience and not by abstract theorizing. For example, the significance of the relationship between multiple conductors, one of the foundations of AudioQuest design, was learned thanks to an accidental experiment. Before auditioning these cables; we took a moment to gaze upon the beautiful and stylish cases that held these cables; what an elegant presentation! They looked like beautiful jewelry for your audio system, with their silver plated RCA connectors and substantial, (and very nice looking), jackets that shield and keep the low level noise from creeping into your audio system. When we unscrewed the outer part of the RCA connector to look at the way they were terminated, we were taken aback to find that they were not soldered. You see, AudioQuest only employs six nines (99.9999%) copper and they realize that the metals found in the solder itself "contaminates" and impede the delicate audio signal. When other cable manufactures take great pains to use high-quality copper, and then simply solders the wire to the connector, the integrity of the audio signal is compromised. AudioQuest has found a perfect solution to this dilemma, they use a process that is called "Cold Weld", and this term sounds a bit contradictory, because there is no welding involved. They utilize a machine that crimps the wire upon the cable with over a ton a force or compression. This essentially "fuses" and bonds the wire to the connector; presto! No soldering required! Pretty cool! This allows the audio signal to travel effortlessly without compromise, and helps keep the magic of your music intact! After looking at these cables for a moment, another thing that caught our eye was these battery packs that were attached alongside the cables. Upon further investigation, when discussing with cable wizard extraordinaire Bill Low himself, would find that the sound of the cables would sound substantially better after many hours of playing music thru them. What was causing this phenomenon? What he found is that dielectric, (the non-conductor) will slowly charge of from the electrons flowing thru, the longer you play your system; the better it sounds, makes sense right? So Bill Low came up with a unique solution to address this issue, by adding a battery pack on the dielectric part of the cable, he discovered that now the system will now play at its optimum, regardless of how long the system is played. In other terms, by adding this battery pack, called a DBS or Dielectric Biasing System, is keeping the dielectric in a fully charged state to reap the full benefits of your music at all times! We started with the Columbia 1m RCA interconnect on our audio system; we were amazed with the clarity, and how effortless the music flowed thru our loudspeakers! So we tried the next level in their series, the Colorado 1m RCA; we heard even more detail, and more emotion into the recordings. Looking into the differences between the Columbia and Colorado we found that that the Colorado uses a different type of material for the dielectric to achieve this. Not thinking it was possible to hear much an improvement with the Colorado; we decided to try their flagship cable, the Niagara. And wow! We were blown away! The Niagara continues with an even higher quality dielectric; however the Niagara employs the highest purity of silver in the wiring to retrieve all of the smallest of nuances in your favorite recordings. Once you listen to your listen with a set (or two) of the AudioQuest Niagara interconnects, you may finding yourself listening to all our treasured recordings, and feel like you are listening to them all over again for the very first time! In conclusion; we find the Columbia interconnect cables from AudioQuest not only to be great sounding cable, but a terrific value as well! However, if you can afford moving up to either the Colorado or the Niagara, you will notice even a more startling change in the performance of your audio system. It will appear that a veil has been lifted from your system! The entire series of the AudioQuest River series interconnects are available here now at The Stereo Shop. They are available in lengths starting at .5 meter and your choice of connections, either XLR Balanced or RCA terminations. Stop by The Stereo Shop today and discover how by simply changing a cable (or two), can make such a profound difference in your audio system!